Clearwater Beach isn’t just a great place for summer vacation. Winter in Clearwater Beach, Florida is beautiful as well! The sun is still warm, and Clearwater Beach is full of fun throughout the entire year. Looking to escape from cold weather and snow? Call B&W Management, Inc. today to secure a beachfront condominium with beautiful views of the Gulf of Mexico. Winter in Clearwater Beach remains warm, with a beautiful beach. Average Clearwater Beach temperatures range between 73° and 66° during the day. At night, it can get a little cooler but still averages between the mid 60°s and upper 50°s. The warm sun makes it a great time to walk on the beach. Winter in Clearwater Beach is a great time to go for hikes on the beach, like walking to Caladesi Island. If you’re looking to get into the ocean, you may find it a little cool. The Gulf of Mexico water temperature in the Clearwater Beach area drops for the mid 70°s in November to the upper 60°s in December. The water temperature then remains in the 60°s throughout the remained of the winter. Clearwater Beach has great food that is often celebrated. There are events celebrating the delicious food throughout the year such as Stone Crab Festivals, Clearwater Beach Restaurant Week, and Clearwater Beach Uncorked! The cool weather also highlights a lot of cool weather foods on the local menus that you may normally overlook during summer, such as Drunken Shrimp at The Bait House, Backwater’s Hot-Crab Seafood Dip, S’mores Creme Brulee at North Beach pub and more! You won’t miss out on holiday fun. There are fun events and great places to celebrate the holidays in Clearwater Beach! Celebrate Thanksgiving with a home-cooked Thanksgiving dinner right in the condos! Each unit in Surfside Condominiums and The Villas of Clearwater Beach come with fully equipped kitchens and easy to get to grocery stores nearby! “It’s vacation, I’m not looking to cook a large meal.” – no worries, there are many great restaurants celebrating with full Thanksgiving dinners nearby including Bob Heilman’s Beachcomber Restaurant and Columbia Restaurant (Sand Key). Both of these restaurants require a reservation for Thanksgiving. Christmas in Clearwater Beach is full of events such as Holiday Lights in the Gardens, Christmas Town at Busch Gardens, Winter’s Wonderland at Clearwater Marine Aquarium and Christmas Eve dinner cruises! 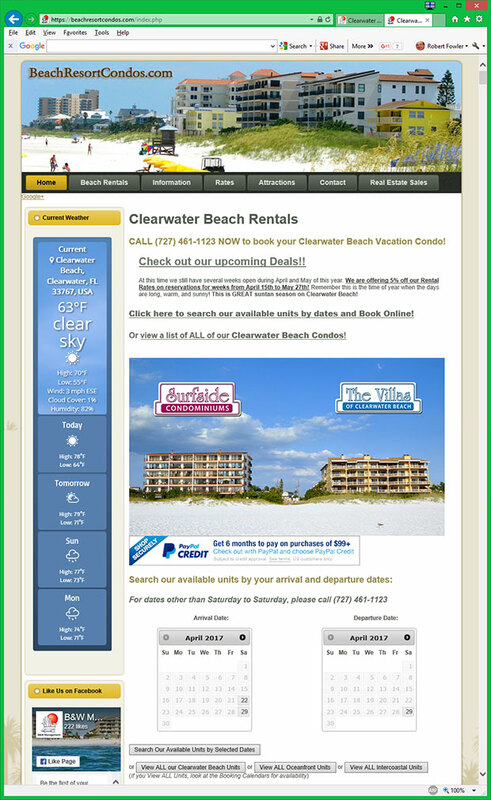 Winter in Clearwater Beach is a great time to take a day trip to Crystal River, Florida. As the Gulf of Mexico cools down, manatees surround the warm spring waters in Crystal River. It’s the perfect time of year to kayak around the springs. The beautiful area has crystal clear water that stays over 70 degrees throughout the entire year and is filled with manatees! You can combine a trip to Crystal River with a short visit to Tarpon Springs, or just take a day trip to Tarpon Springs by itself! It’s a wonderful Greek village filled with delicious Greek food and unique shops surrounding the sponge docks that the city is known for. If the weather drops too cool to be outside, or if a small rainy day disrupts your winter vacation, there are a lot of fun indoor activities nearby! The Clearwater Marine Aquarium is a must-do for the whole family! It’s not your typical aquarium. The Clearwater Marine Aquarium is a marine life rescue center focused on the rescue, rehabilitation, and release of sick or injured marine animals. While visiting the Clearwater Marine Aquarium, you’ll get a chance to meet Winter the dolphin, star and inspiration of the hit movies Dolphin Tale and Dolphin Tale 2, both filmed in Clearwater Beach. The Museum of Science & Industry, located in Tampa, is a great place for all day fun! The museum has exhibits on weather, dinosaurs, space, flight, natural disasters, human development life stages, an IMAX Dome Theater, and the Saunders Planetarium. There’s also an outdoor ropes course and zip line! If a cool day has you trapped inside and your kids are full of energy, take them to AirHeads Trampoline Arena! AirHeads Trampoline Arena is a full, indoor, trampoline park making it a great place to escape the cool weather. Just jump around and have fun, play some AirSports like dodgeball or basketball, or have fun playing some arcade games!